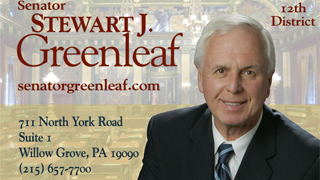 State Senator Stewart J. Greenleaf (R-Montgomery/Bucks) has represented Pennsylvania’s 12th Senate District since 1978. He was a member of the House of Representatives from 1977 to 1978. He is the Chairman of the Senate Judiciary Committee.